Hi! I'm Mark Frobose. 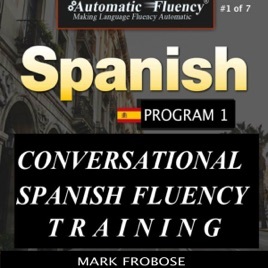 I'm known as The Language Guy, and I also created this entire program, Conversational Spanish Fluency Training. Listen, you and I both know that it's one thing to learn Spanish and quite another to be able to converse in Spanish with native speakers. To reach that level of expertise, you need training, practice, and lots of great instruction, and that's what I'm offering you here. The approach is simple: Master the conversational basics, the real bricks and mortar of true Spanish conversation, the foundation. Most conversational Spanish programs focus on one conversation and then try to explain to you how they reached that level. That's like trying to walk you up to Mount Everest before teaching you how to climb a mountain. I'm taking the opposite approach. I'm concentrating on teaching you the basics, the bricks and mortar of conversational Spanish fluency, the foundation - first, not last, before you climb the mountain, not after, and I'm teaching it to you now, not later, one high-frequency brick at a time so that you'll have the foundation when you reach the conversation.